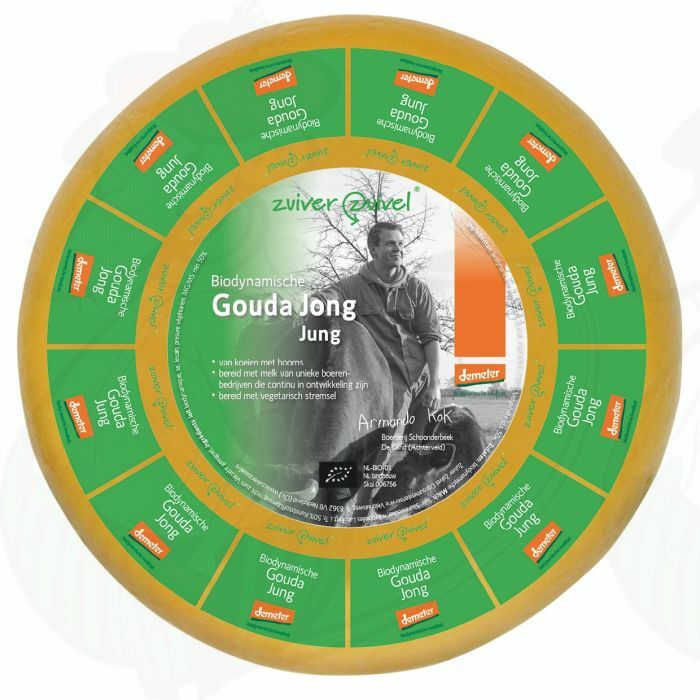 The young Gouda Organic biodynamic cheese from Zuiver Zuivel is soft, fresh and creamy in taste. This extra quality cheese is a real classic. It is typical for the Gouda cheeses to have a flat cylinder shape. This cheese is popular with virtually everyone because of its creamy and soft character. Nice as a snack or for in a sandwich. The young Gouda Organic biodynamic Demeter cheese is made with vegetarian rennet, so that it can also be consumed by vegetarians. This cheese is 100% vegetarian and free from wheat and gluten. In its natural form, it is best stored at a cool temperature between 4 and 7 degrees Celsius. We cut the cheese to order, exactly according to your wishes, and vacuum pack your order.